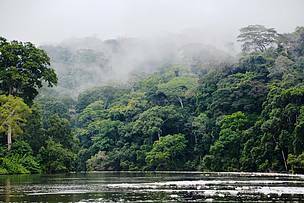 Spread over three countries - Cameroon, the Republic of Congo and Gabon - the Tri-National Dja-Odzala-Minkébé (TRIDOM) transborder forest covers 178,000 km², or 10% of the Congo Basin rainforest. Eleven protected areas extend over 42,319 km² or 24% of the landscape and contain some of the most pristine natural sites remaining in the Congo Basin: Odzala, Mwagna, Ivindo, Minkébé, Nki-Messok Dja complex, Ntokou Pikounda, Boumba Bek. 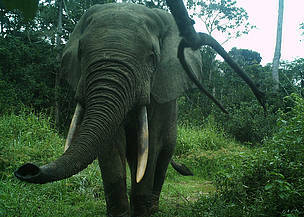 TRIDOM is a large mammal stronghold: it may hold a (declining) population of 25,000 elephants, as well as large numbers of gorillas and chimpanzees (more than 40,000). The landscape has a very low human population density: close to 1 inhabitant/km². Together with a low road density, this explains why TRIDOM is so important for large and medium-sized mammals. Almost 97% of TRIDOM is forested, and the area has a very low deforestation rate (estimated at 0.19% per decade over the period 1990-2010). Close to 65% of the landscape is covered by logging concessions. TRIDOM is also home to an indigenous BaAka population of around 10,000 people. TRIDOM is rich in baïs (forest clearings) that are visited by elephants, gorillas, buffaloes, giant forest hogs, sitatunga, pythons and other large animals. Many baïs have a rich mineral soil. TRIDOM is covered by a 2004 agreement, by which the three governments commit to a coordinated approach and sustainable development of the interzone in between protected areas. 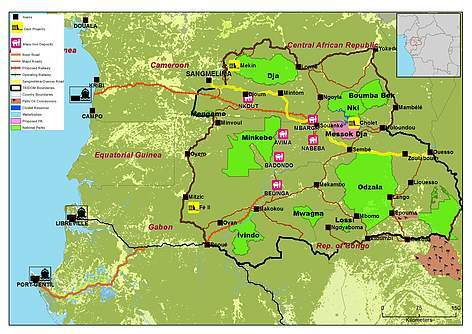 It is also one of the 12 COMIFAC-recognized priority transboundary conservation programmes in the Congo Basin. TRIDOM is also proposed as a “Man and Biosphere” Reserve (UNESCO-led feasibility study on-going). In 2014, the three governments also signed an anti-poaching collaboration agreement which provides the procedures that bi- or tri-national joint patrols must follow. It creates a new structure (the TRIDOM brigade) and allows bi-national patrols to enter up to 20 km into a country’s territory. WWF started working in TRIDOM in 1993 and had field bases in all three countries. WWF has been contributing to the creation and management of three national parks, developing the landscape approach, supporting anti-poaching capacity and application of wildlife law, developing community management systems, stakeholder platforms and private sector collaboration, monitoring wildlife and human impact, and supporting sustainable rural livelihoods. TRIDOM is also one of WWF's priority landscapes in the Congo Basin. In TRIDOM, wildlife and ecosystems flourish in a connected network of protected areas, logging and mining concessions, enabling development of local communities via sustainable use of natural resources, and incentives for participating in conservation. Combating Wildlife Crime: Curtail the ongoing poaching crisis by improving the effectiveness of patrols, full prosecution of wildlife criminals, systematic species monitoring, widespread communication and local society engagement. Protected areas: Ensure effective conservation in focal Protected Areas, and drive the creation of 6,000 km² of new Protected Areas. Community development: Promote sustainable development to help local communities benefit from conservation and sustainable management of natural resources, and dissuade them from poaching and commercial bushmeat hunting. Sustainable Forest Management: Push to ensure that logging concessions covering 30,000 km² provide effective protection for (managed) natural forests and wildlife. Responsible Mining and Infrastructure Development: Steer mining and infrastructure projects to apply a “no-net loss or net gain of biodiversity” policy, and minimize the biodiversity impact of the Chollet Dam project. In order to achieve its mission in TRIDOM, WWF works closely with the governments and concerned ministries of the three countries, as well as many other partners. Our work has been made possible through the generous support of our donors: EU, USAID, USFWS, UNESCO/CAWHFI, GEF/UNDP, Save the Elephants, Adelle Foundation, FFEM. TRIDOM is one of Africa’s elephant poaching hotspots. Very high local ivory prices, which have increased tenfold since 2005, provide huge incentives for well-established criminal networks and local poachers. Elephant poaching has become an industrial activity. The power of ivory poaching networks is very high. Efficient sanctioning through courts remains a big challenge because of weak laws, corruption and complicity. The huge size of the landscape means that, even with improved efforts, patrol teams remain thin on the ground, leaving much of the field to poachers. Ivory hunters and traffickers operate across borders with a large amount of ivory passing through southern Cameroon. - TRIDOM overlaps with an emerging iron ore province. Many major iron ore exploration projects are under way (Avima, Bandondo, Nabeba in Congo; Nkout and Mbalam in Cameroon; Belinga and Yokou in Gabon). The recent fall in iron ore prices has put these projects on hold, but this can change any time. - The cumulative and indirect impacts of these developments, including additional infrastructure (railroads, hydroelectricity, transmission lines), could well break up TRIDOM and reduce it to a set of isolated and vulnerable protected areas. - The TRIDOM heartland is also being opened up by the ongoing paving of the Trans-TRIDOM highway, which connects Sangmelima in Cameroon to Ouesso in Congo. Already we are seeing increased settlement, immigration and land speculation. - A 600MW dam is proposed on the Dja River at Chollet (Cameroon-Congo border), a remote intact zone rich in elephants, gorillas and chimpanzees. It is Congo’s second highest hydro-electric potential. The 207 km² projected inundation area overlaps with Nki National Park in Cameroon and the proposed Messok Dja Protected Area in Congo. - Coordinated planning for mining and conservation – including zoning, biodiversity offsets and settlement policies – will be necessary if TRIDOM is to survive as a robust intra-connected landscape. Plans for oil palm plantations in TRIDOM’s heartland have been proposed in Mintom (Cameroon) and Sembe (Congo). These plans seem to be cancelled for now, as these locations are situated in important areas for ecological connectivity. In Southeast TRIDOM, deforestation for palm oil planting has started in the 55,000 ha Mambili concession awarded to Atama Plantation. Aside deforestation, another major problem with palm oil plantations in thinly populated areas like is the huge number of workers needed. These workers and their families can put tremendous pressure on the remaining forests, particularly through hunting for bushmeat. In this case the situation is all the more worrying, as the Mambili concession is located in the midst of prime great ape habitat as well as an elephant migratory route between Odzala NP and Ntokou Pikounda NP. Improved accessibility and demand for protein in urban centres drives the bushmeat trade. While local people depend on wild meat resources for their subsistence, commercial hunting wreaks havoc on ecosystems and wildlife numbers. Wildlife management in logging concessions and enforced strict regulation of the bushmeat trade are needed in order to mitigate the devastating impact on wildlife.